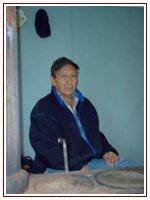 The Sioux Nation Relief Fund (SNRF) focuses on serving the thousands of Sioux Indian people living with hunger, isolation, and poverty. On the Sioux reservations, unemployment is staggering 35 to 85 percent, compared to the national average of 8.9 percent. Some 50 to 60 percent of the people live below the federal poverty level. On the Pine Ridge Reservation in South Dakota, it is said that 59 percent of the homes are considered substandard... That about 39 percent of homes lack electricity... That about 60 percent of families have no telephone. Children and the elderly are most vulnerable to poverty's affects. Many are routinely burdened with lack of food and nutrition-related illnesses, lack of access to health care, and life in substandard housing. No one should have to live like this. he could not afford fire wood. SNRF programming is designed to give the Sioux people a sense of partnership and hope. Sioux Program Partners and volunteers help distribute SNRF goods and services to their communities. Their participation is at the heart of creating positive changes and building stronger Native American communities. Smiles abound as Elders and their families have an opportunity to share a positive time together. Provides nutrition and produce to the most vulnerable Sioux Indian people. 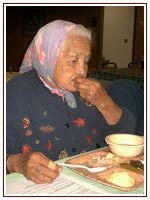 Ensures that Elders without electricity can cook as well as stay warm in the winter. 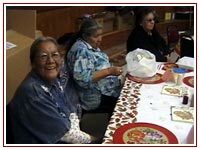 Provides Thanksgiving community meals for those Sioux Indian people who might otherwise go without. The vital relief afforded through SNRF programming is the hand up that Sioux Program Partners are looking for. They look for a hand up — not a handout — in their unrelenting determination to make a difference for their people.